Caiman free games: SnowCraft by Nicholson NY. 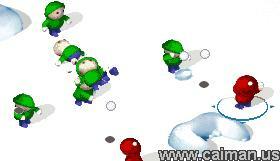 A nice snowball fighting game in Flash. This is a fun minigame and it has nice graphics too. Two teams throwing snowballs at each other and try to knock out the opponent team. You play with the three boys on the red team. Your opponent, the green team is controlled by the computer. The number of players in the green team depends of the level you are playing. In the first level there are 3 opponents, in the second one 5 opponents, and so on. To control your players, simply place the mouse pointer over one the kids on the red team. A bullseye will appear on your selection - HOLD the left mouse button down and you can move that player around the screen. Once you release the left mouse button the player will throw a snowball - the longer you hold the button down the farther the snowball is thrown. You can only move one player at a time and the game ends once your team has been crushed under a wave of snowballs. I discovered that when you put a player in the right upper corner of the playfield, nobody will attack him. At this manner I played with only one player at a time, while the other players were in a safe place. When you move your player very close to an opponent you can throw enormously many snowballs in a very short time, by clicking very fast with your mouse. But watch out, the opponent can do the same! A good advice: Keep moving! Else you will be as a bird for a cat. 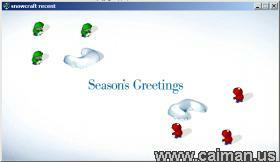 Classic Pacman - Merry .